Looking for a picturesque and unique alternative to the existing traditional vast banquet halls, impersonal ball rooms and generic meeting space offered in Las Vegas? Look no further than The Resort On Mount Charleston the only full-service hotel on the mountain. Surrounded by incredible mountain views, The Resort on Mount Charleston provides the perfect setting for magical weddings, meetings and memorable events. Even better, book a 2012 wedding at The Resort on Mount Charleston by March 31, 2012, and receive a complimentary champagne toast on the big day. Break away from the hustle, bustle and distracting neon lights at The Resort on Mount Charleston. Only 30 minutes from the Las Vegas Strip, sits a majestic, full-service, rustic hotel with beautiful natural surroundings that make it the ideal location for breathtaking weddings, corporate retreats, team building activities, picturesque parties and business events. With full catering services to complement any occasion and great group room rates to accommodate guests, The Resort on Mount Charleston is set high in the mountains of the Toiyabe National Forest. The air is crisp, the average temperature is 20 degrees cooler than Las Vegas all year round and the hotel is a hidden gem that takes no longer to get to than a drive down the Strip on a busy Saturday night. Each guest room overlooks tall peaks, with a charming mountain-view restaurant, rustic banquet facility, classic chalet-style bar and friendly staff, the high-altitude retreat surprises at every turn. 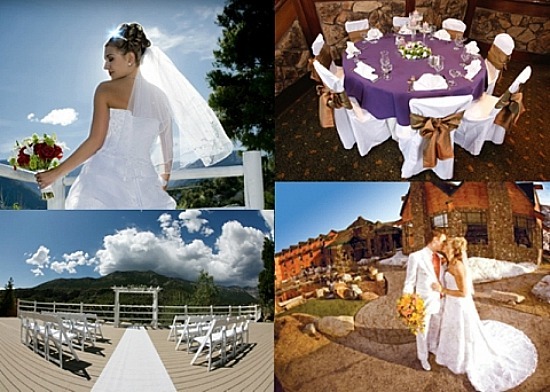 Couples say “I do” in a picturesque and cool natural setting at The Resort on Mount Charleston. The romantic location is the preferred choice for hundreds of couples each year to exchange their wedding vows. From the most intimate wedding to the grandest affair, The Resort on Mount Charleston can accommodate the wedding ceremony, reception, and rehearsal dinner. Guests will welcome the comfortable guest room accommodations and impeccable service during their stay. Perfect for a Rehearsal Dinner, A Cut Above Restaurant offers incredible views and semi-private dinners for up to 30 people. Served either plated or buffet style, A Cut Above offers delectable dining in a scenic setting. The Resort on Mount Charleston offers a number of specialized wedding packages, including the “Wedding Getaway” and the “Winter Wonderland Wedding” as well as a number of other wedding packages that are sure to please. Among the resort’s wedding highlights is The Bridal Suite. Designed especially for brides-to-be, the Bridal Suite features six-foot counter tops with spot lights and mirrors for hair styling, make-up, and wedding preparations. A balcony faces the mountains for exquisite views, and the room contains a wet bar and refrigerator, hair dryer, iPod docking station alarm clock, and much more. With its stunning views, the resort’s Canyon Terrace and Courtyard is its most popular wedding location. Couples exchange vows amidst elegant gazebos and decorative arbors. The Canyon Terrace and Courtyard can be utilized as either one or two separate venues. Rustic, arched ceilings and floor-to-ceiling windows surround the Aspen Room - one of the largest banquet rooms. A mammoth pine post supports the high ceiling and serves as a dramatic centerpiece to the elegant room. This oversized banquet room accommodates groups up to 200 and is like a mountaintop chateau –cozy and warm, providing the perfect venue setting for romantic weddings. For inspired brainstorming sessions and business meetings, The Sandstone Conference Room is the ideal venue. With gorgeous vista views of the canyons, The Sandstone Conference Room is private and can accommodate up to 30. It has built in audio-visual equipment and a portable podium. For more information on weddings and events at The Resort on Mount Charleston, contact the Wedding Sales and Events Manager at 702-872-5500 or by e-mail at events@mtcharlestonresort.com. The Resort on Mount Charleston is located at 2275 Kyle Canyon Road.